DISCLAIMER: You are viewing an archived page 2015 and before. Click here to find out what teachings we've changed since then. Our primary mission at Christian Overcomers is to help arm God’s people with the TRUTH. So in addition to our verse-by-verse Bible Studies via Podcast, YouTube, and Blog Posts, we’ve also created an Amazon Bookstore with many great works to be studied along with the Bible. I say “along with” because it can be very difficult to understand or apply many parts of the Bible without a thorough knowledge of history, current events, government, migrations of various peoples, and etc. So we’ve tried to make it easy for our listeners to access some of the best resources out there by putting them in all in one place – Christian Overcomers Suggested Booklist. What we’ve also decided to do from time to time is to give you a little taste of some of the resources we recommend by periodically highlighting a certain book with a review or simply quoting a few paragraphs or pages from them. 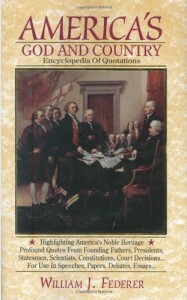 Below is a quote from one of my favorite resources, America’s God and Country Encyclopedia of Quotations by William J. Federer, a book that I have used for years in my own research whether it was for writing college papers, for my blog postings, or just to prove to a friend that America was indeed founded as a Christian Nation. You may even want to share this quote with your “liberal” friends 🙂 Before reading this book I never knew that there was ever such a thing as a “Year of the Bible”. Check it out! Would to God that our people would have listened to Ronald Reagan’s call to America to get back into God’s Word and to apply it to our everyday life. We wouldn’t be in the mess we are in today! © 2019 Christian Overcomers. All rights reserved. Theme by Solostream.